The Newport Pink harness is inspired by the beautiful city in south east Wales, which it’s importance was dated from the 19th-century for it’s grand Newport Docks that was used to transport trade goods down local rivers and canals. The lovely, flushed fuchsia tartan is a pattern consisting of criss-crossed horizontal and vertical bands in pink, white and black weaved throughout the fabric. The classic plaid captures the rosy tones of pink in various warm shades, which gives the design such an appealing charm. The piece is outlined with a subtle touch of light blush, angelic halo ribbing adding a sweet tenderness to the composition. 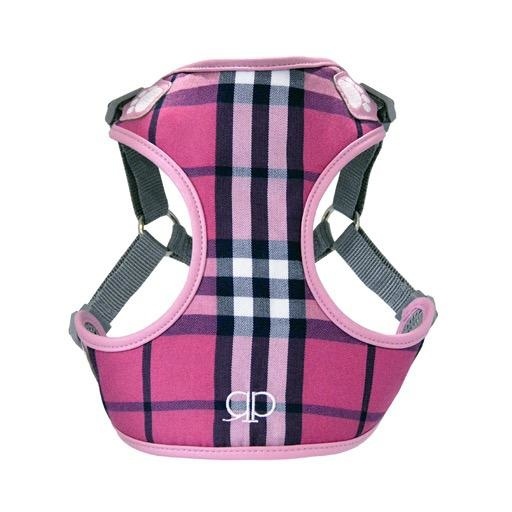 It is accented with a tint of rose embroidery completing the look to compliment the most feminine of canine breed.